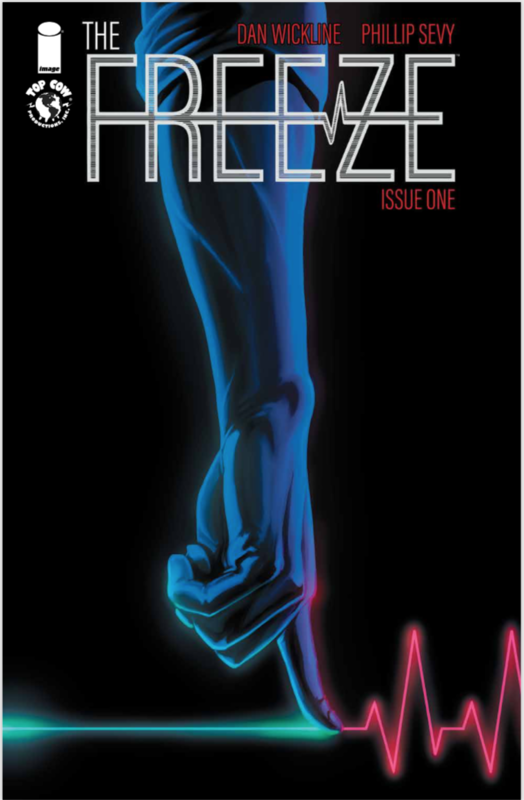 The Freeze #1 Review – AiPT! Have you ever felt like ice? Like you were frozen by a sudden feeling of panic, or fear or doubt? That terrible sense of being locked into place, still as a statue. What if you couldn’t escape that feeling? That’s the question posed by the fascinating new series, The Freeze. There have been plenty of ways the world has ended in fiction. Zombies, floods, earthquakes and aliens. All cataclysmic, quite devastating and if done right, visually stunning. But what if, instead of an explosion, the world ended with a whisper? That’s what immediately sets The Freeze apart from most comics. One day, for no particular reason, the whole world stops and humanity is frozen in place, save one man: our protagonist Ray. Dan Wickline conjures up a fascinating apocalypse scenario that poses many interesting questions you never thought to ask yourself, like how many planes are up in the air at any moment? How many surgeries are being performed at a certain time? How many people are driving their cars? And what happens when everyone operating them stops moving? By the end of the issue, the potential will be eating at your subconscious, not just the question of what exactly is happening. There’s a certain horror in the possibilities this series presents here and I am looking forward to future issues exploring this in depth. While the concept alone would be enough to invite me on for future issues, the creative team is also dead on. Wickline crafts an interesting story with likeable (if somewhat cliche) characters. Some of the dialogue is a bit clunky but that is easily overlooked thanks to Philip Sevy’s great art. Panels are well drawn and and everything feel right where it should be in this grand story. I especially appreciate the blue shades that pops up throughout the issue, signifying someone is frozen. Sevy helps create an eerie and unsettling setting. All in all, this is a solid debut from a new Image team and I look forward to new installments. The Freeze promises a horrifying new apocalypse you do not want to give the cold shoulder. Some of the characters aren't exactly "new ideas"